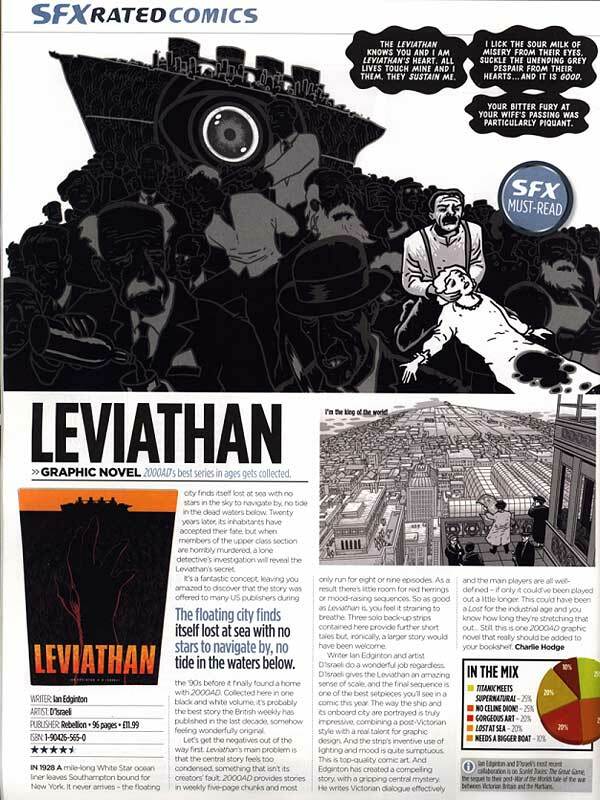 Review of the collection of Leviathan by Charlie Hodge in SFX #150. Copyright, Design and Patents Act 1988. Apologies if you're getting a bit sick of this self-referential stuff, but I've not been a media darling before and I suspect it's not going to last. It also led me to thinking about the value of reviews. For the creator, that is - obviously a good review in a newsstand magazine like this should help sales (as Ian put it, "real people will see this one! "*) - but there's a danger as a creator in paying too much attention to reviews of any kind. Working in a commercial arena like comics is a bit like walking a narrow causeway between two abysses; on the one side is the pitfall of overconfidence, on the other excessive preciousness. Whatever happens, you always have to balance the need to maintain quality against the need to bash out your week's quota of pages, and regardless of how well or badly a job has gone, you have to see it through to the end. Drawing a comic swallows up so much of your life that it's very difficult to see anything bad said against your darling; I have one friend who was plunged into gloom over the three negative reviews of his work, when there had been twenty good ones (though he cheered up a bit when I pointed out how he lucky was to get twenty-three reviews, good or bad). When the first issue of The Great Game came out, the thing that worried me most was it attracting seriously negative comment, as I was going to have to stay awake for a week to finish issue four regardless. For actual feedback I rely on a few old friends whose opinions I know I can trust, and particularly, who I can trust to tell me when I'm going astray. Compliments are wonderful, but they don't teach you very much**, and as a professional artist, I'm judged by the worst work that I turn out each year. So I maintain that lofty old-thesp-style stance of "I never look at my reviews, dahling" which is, of course, horribly disingenuous, as I have Ian and other friends to ring me up and let me know when someone's said something nice about me. And let's face it, it "the best story (2000AD) has published in the last ten years," is pretty damn cool. *Ian wishes me to point out to members of the comic-reading fraternity that he does love you all really. **please don't let it stop you though. Labels: SFX review Leviathan "media darling"
As a non 2000ad reader, but a fan of your work, I am looking forward to the Leviathon collected coming out - when will that be? Saw that Matt- We got Fanzine of the month in the same issue! Not as much room as you, but just as nicce a feeling!